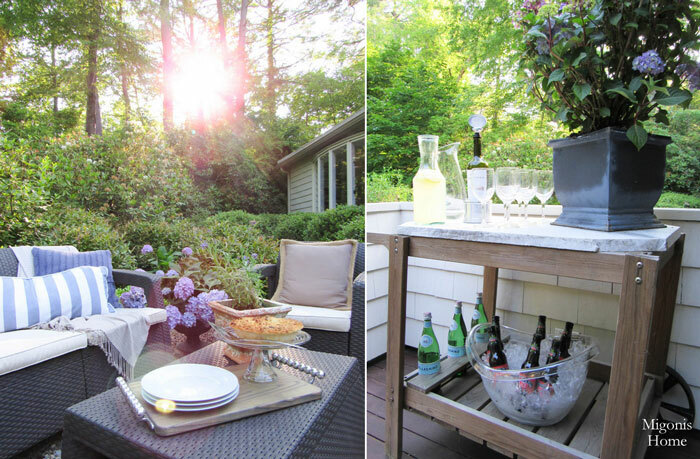 Today's beautiful backyard belongs to the lovely Jen of Migonis Home. Her outdoor space is a great illustration of how you can have an elegant but simple outdoor space with just a few elements. We moved into this home almost exactly a year ago today and it has been amazing to have such a gorgeous spot for a backyard. In our previous home we were surrounded on every side so we never felt like we had privacy and this space gives us exactly that. I love feeling like we can host our weekly summer dinner parties in a beautiful space that we have created to be an extension of our living area inside. It's comfortable and done in my favorite neutrals with a little bit of color with the hydrangeas we are slowly adding to the yard! Want to see more? Head over to Migonis Home for the full tour! I'll see you back here tomorrow for more inspiring outdoor spaces.